kyliemou wrote: It has to be an April's Fool because I would surely be pissed if this turns out to be for real. Honestly, I don't see how Twilight and Roswell are similar. Roswell was way better written and the love stories were better too! I am not a fan of Twilight at all. This is surely a disappointment if it's not an April's Fool joke. While I don't hate Twilight and I was disappointed with many aspects of Roswell by its season three end - the overall love story between Max and Liz just pulls me in way more than Edward and Bella's romance does. 1) M/L vs. E/B - main protagonist couple who are two different life forms. 2) Liz/Bella - Lead female characters who are human but love and accept the boy despite their non-human status (just substitute "alien" for "vampire"). 3) Max/Isabel vs. Edward/Rosalie - a sibling foundation effected by the romance/relationship status of main couple. Both "sister" roles are cast with the stereotypical "blonde bombshell" in mind and are written in character with "said sister" (Isabel/Rosalie) clashing with "lead female role" (Liz/Bella). Sister does not want secret revealed based on the premise that it effects "aliens" and "vampires" entire existence. 4) Non-human hero saves the day (Max/Edward): Max saves Liz's life after she is shot by using his alien power to heal. Edward saves Bella's life by using his non-human strength to stop a colliding truck from killing her. Down the road, Max is reluctant to be Liz due to his non-human status. He doesn't want them to get hurt. Edward is reluctant to move forward with Bella due to his non-human status. He is also afraid of hurting her. 5) High School Science/Biology class theme: Extremely similiar setting for both Max/Liz and Edward/Bella to meet up and converse. 6) Good aliens/bad aliens vs. Good vampires/Bad vampires theme. 7) Bella seeks to become like the vampires (and does); Liz does become like the aliens (acquires alien powers). Love triangles: Liz/Max/Tess and Edward/Bella/Jacob. 9) Liz leaves the love of her life for the sake of saving the world (to protect Michael/Isabel and all their friends); Edward eventually leaves Bella to keep her safe. Both characters hurt the ones they love in order to do what they feel is right. 10) A baby eventually results from one of the triangle unions. In Roswell, the UC couple has one (baby Zan). In Twilight saga, the CC one does (baby Renesme). Okay, granted, the author may have twisted things up a bit with the male vs. female characters and storylines but the similar feel is definitely there for me. If by some freaky coincidence the author was a Roswell fan, I couldn't help but think the author in some ways took the Roswell premise and put her own vampire twist on it - leading Edward and Bella to a point where she may or may not have preferred Max and Liz to be. Once again, I don't know for sure if the author ever watched our show or not - I'm just speculating that it's possible. The two leading love stories are just very eerily similar to me and Roswell did come first - Twilight in like 2005 and Roswell in the '90s. (*shrugs*). And I loved the message! That is the best possible comparison, how Roswell and Twilight are the same. Hmmm you could have used Smallville too. I'll be laughing all day!! I was shocked.....and still am. I realize it is April 1st, but when does April 2nd arrive? Must admit I read the first Twlight book, and even saw the movie.....but that is the end of my interest. Good joke, but please go back to Roswell! I really can't think of an appropriate response for this other than WTF? Pretty damn good April Fool's joke. You had me for a minute. Avatar Credit: I have no idea! If its your let me know! This hasn't been confirmed as a joke. I am assuming this is a joke because they shouldn't do this... 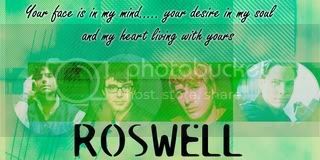 Twilight is one thing... Roswell is another and we're fans of Roswell. Yeah if they want to honour it then Crossovers or other shows fanfic is the place for it. I really hope this is a joke for April 1st if not then I'm seriously considering taking my fics off here. I've had trouble with this sight for the past few days, I've had to re-register because there's something up with my account. I come here for great Roswell fics! I don't know about anyone else, but my interest has not waned! My interest in Twilight, however, is non-existant! I'm saddened by the switch. There are a lot of great Roswell fic writers out there and I hope they don't give up on writing!! I also hope this board continues to carry Roswell fics or at least let's us know where else to look for them. Oh, it's a joke!! Phew!! That would have been messed up!!!! Yup, we hope it's just a joke. I must admit - after I first got on, I thought the Roswell board just went under a reconstruction. I was ready to compliment the new layout when my attention finally shot to the new titles listing off the fanfiction sections - Twilight? !.